In 1990, Amy Wend and a partner set out to create a unique facility in the Napa Valley. They began by cultivating extensive organic gardens and selling the fresh produce at local farmers’ markets. With the help of her herd master, Amy began acquiring a small herd of goats, one of whom was Emily, who is featured on our cheese labels. This fledgling company was christened Skyhill Napa Valley Farms and, in 1991, the first fresh goat cheese was sold alongside the organic produce. Two decades later, the business has flourished and is now located at a more modern and spacious facility a short distance away from the original Napa Valley property. This relocation has given our goats additional grazing land, and has allowed us to sustainably farm the surrounding acreage. 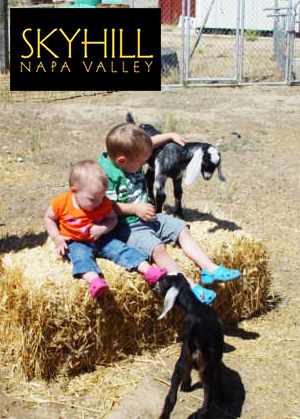 At Skyhill Napa Valley Farms we are passionate about what we do and continually strive to create the highest quality products. Our cheese is a true artisan cheese and is created weekly using the very best ingredients which include the exclusive use of fresh California grade A goat milk. Using the greatest standard of care, our goal is to keep our products pure, simply crafted, and true to their unique natures.